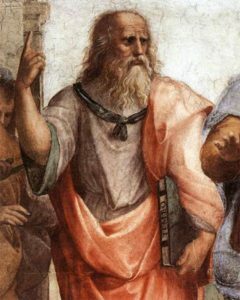 Plato employed the maxim “know thyself” ("gnôthi sauton,“ translated as "come to know thyself" or "learn to know thyself") in his dialogues at The Academy. He taught that knowing one’s self is a necessary first step in the pursuit of happiness. He believed that only when we truly know who and what we are can we pursue our true nature to happiness and fulfillment. I’ve coined the term “Plato Parenting” based on this maxim. The idea is that parents can help their children discover, explore, and develop their true interests and nature to discover who they are. But would this be helicopter parenting? Parents considering an active role in helping their children develop their interests may wonder whether this would constitute “pushing” (like a tiger mother) or “hovering” (like a helicopter parent). They may not know where they should fall on the spectrum from being more involved in the management of their children's lives to less involved. It’s clear from an examination of the research literature that the most effective parents are those who are involved and responsive to their child and are authoritative and have high expectations. Parents who are disengaged and uninvolved are less effective. Parents who have low expectations and are permissive and indulgent are less effective. We’ve all seen this in action at the grocery store when a toddler throws a tantrum over candy, and a parent immediately gives in. And having low expectations tends to create a self-fulfilling prophecy. The most effective parents, when the goal is producing a happy, productive adult, are nurturing and responsive, yet they are also authoritative and have high expectations. What do I mean by "authoritative" and "high expectations?" Some people confuse the terms authoritative and authoritarian. Authoritarian parents demand a sort of blind obedience from their children. That's not good. Authoritative parents take a more moderate approach that emphasizes setting high standards and expectations, being nurturing and responsive, and showing respect for their children as independent, rational beings. High standards and expectations include instilling a strong work ethic, encouraging the productive use of time, and encouraging dedication to doing one’s best. Not all children are born with strong motivation, work ethic, and the knowledge of how to use their time productively to accomplish goals. Many if not most need to be taught these habits. Not only are children who are taught these skills more likely to be successful, but they’re also happier. Children, like adults, are happiest when they're engaged in something they find interesting that provides opportunities for growth. In other words, when they're pursuing their interests. They’re not happiest when they’re “hanging out” or wiling away the hours playing a video game because they can't think of anything better to do. A growing body of scientific evidence indicates that pursuing one's genuine interests toward a goal is highly correlated with happiness, as well as other positive traits such as increased concentration, self-esteem, and performance. Don't push your own interests on your child. When embarking on a program of helping your child identify and pursue his or her true interests, be careful not to fall into a trap of trying to influence your child to pursue what you are interested in. Carl Jung said: “Nothing has a stronger influence … on their children than the unlived life of the parent.” Often, when parents try to “craft” the perfect life for their child it bears an uncanny resemblance to the one they wish they’d had. We need to accept our child for who he or she is. If we don’t, and instead try to mold them into what we think they should be, one of two things will happen. Either they will accept our dreams and fail to develop their own, or they will rebel. Neither allows them to develop into their own true self, since one path involves blind acceptance and the other a rejection of the parent’s point of view. A psychiatrist I know in Palo Alto has a practice dominated by high-achieving Stanford grads who did everything they thought their parents wanted them to, realizing their parent's dreams. But now - in their late 20’s and 30’s - they're unhappy and confused about what they want out of life. So, how do you go about helping your child pursue his or her genuine interests? First, you need to identify them. Some children are “born” with strong interests, while others don't seem to have any especially strong ones. I advise parents of young children to expose them to a wide variety of things – art, music, sports, theater, games, and academic disciplines. This should be done deliberately and methodically. Rather than taking your child on the same kinds of outings over and over, plan “field trips” to varied destinations. These can include museums, concerts, farms, zoos, animal rescue centers, hikes, bike rides, birding, the beach, Chinatown, Little Italy, historical sites, factory tours, a stock exchange, art galleries, a courtroom, science fairs, a geography bee, and fruit-picking. Read books about a variety of topics. Talk about current events. Travel. Watch documentaries. Expand their horizons. Observe your child’s reactions and reflect on them. Make note when your child seems intrigued by something. Think about why they are drawn to it, and consider what that might mean. If your child loves Legos, perhaps architecture or engineering would interest them. If your child loves playing outdoors, consider environmental studies. Try to keep an open mind and not be judgmental. Even activities that may seem unproductive can provide clues to worthwhile passions and future careers. The child who seems bossy and unyielding when playing with friends may crave leadership opportunities. The child who is on the phone chatting with friends about their problems all day may be drawn to psychology or counseling. When my daughter was young she loved to tell stories. As a teen she loved social media. Of course that worried me a bit. But now she’s an online news journalist. After exposing your child to a wide variety of things, as they near middle and high school, try to guide them toward selecting 2-4 interests to pursue more intensively to avoid the "jack of all trades, master of none" phenomenon. Get involved and be proactive. Once you’ve identified your child’s interests the next step is to facilitate their pursuit. This is where being an involved parent comes into play. And having high expectations. Dedicate yourself to taking your child’s goals seriously and facilitating his or her achievements by bringing their goals within reach. Don’t just buy your child a trumpet. Find the best music instructors you can afford, structure time in the day for practice, sit with your child when they practice, and take them to concerts. It's ok to actively help your child find opportunities. I know a parent who helped her marine biology obsessed child find a volunteer research internship at age 12 which led to her being co-author on a scientific paper at age 16. What if my child doesn't find a career out of this? It doesn't matter. The young marine biologist who published at 16 went into an entirely different field. But she learned some very important things along the way. She learned how fulfilling it is to delve deeply into an interest, that one needs to work hard to accomplish something significant, that she could do practically anything she put her mind to, and that she didn't actually want to be a research scientist! By adopting “Plato Parenting” as a philosophy you can help your children develop into the happy, productive young adults they are meant to be. What better gift can you give your child than that?